Description: This year marks the one hundredth anniversary of the publication of Bertrand Russell’s The Problems of Philosophy. Envisioned by him as an introductory text, Russell also used the work to propose a number of novel theses which, in tandem with other pioneering material he was producing during the same period, went on to leave an indelible mark on the development of analytic philosophy. 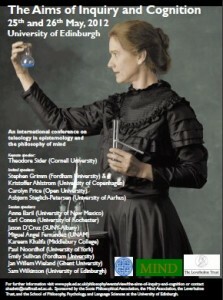 To mark this anniversary, The Centre for the Study of Perceptual Experience is convening its yearly graduate conference on the themes of The Problems of Philosophy: Then and Now. Papers will present contemporary work on any of the major themes in The Problems of Philosophy – but we will particularly welcome work on the nature of experience, perception and sense-datum theory, and on Russell or Russellian topics in general. We hope to promote fresh engagement with the problems discussed by Russell, and investigate the possibilities for useful dialogue between Russell’s approach to these issues and contemporary philosophy. Call for papers: We are currently seeking submissions from graduate students. If you would like to apply to give a paper at the conference, please send an abstract of no more than 500 words to Carole Baillie. Submission deadline: 16th April 2012.